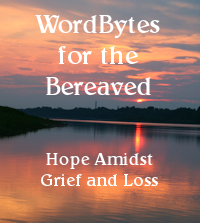 This WordByte is a multi-media reflection that will bring healing in the midst of grieving the loss of a loved one. I wrote it after my dad had an accident with life and death consequences. Because I had to face the loss of my father during the Season of Advent, the Holy Spirit ministered to me by inspiring me with the true meaning of Advent: Jesus comes! Advent is a time for reflecting on the coming of Christ — his first coming, but also his eventual Second Coming, and also, most especially for today, the everyday coming that he does through us as we love others. Play the audio version here, or the video above. There is one more time when Jesus comes: our personal judgment day at the end of our earthly days. We especially notice this coming when a loved one enters the final passageway of life into death. If we put aside our fears and grief, at least for a moment, to imagine (visualize during meditation) Jesus coming for the sake of benefiting that person, we can see more fully the beauty of this coming of Christ. We can even feel a certain kind of unearthly joy. It hurts to let go of loved ones. But we have suffered in loving them before. True love is full of sacrifices, some more painful than others. Our willingness to make sacrifices comes from a heart that really cares. Death is another such sacrifice. Since we want what’s best for our loved ones, we want them to go with Jesus to their new, glorious Home. It’s such a better life than here! If we meditate on what Heaven is like, even with the tiniest glimpse of its wonderfulness we might even feel excited about Jesus coming for our loved one. We painfully feel the hole they leave behind in our lives, but we are happy for them. If we could glimpse Heaven more fully, and if we could see and hear the conversation Jesus has with them when he comes for them, we might even feel glad to accept the pain of our loss — for their sake. If our loved one who is passing (or who has passed away) has been close to Jesus, doing his will, and desiring to grow in holiness, we can imagine their enthusiastic delight and supreme joy in seeing Jesus come for them. They know at the time of his coming, beyond all doubt, that his all-embracing love for them is limitless. They know that they are entering into the fullness of life for the first time, free of temptations, hardships, sorrow, pain, and physical suffering. They know that Jesus is opening the door to life unlimited. 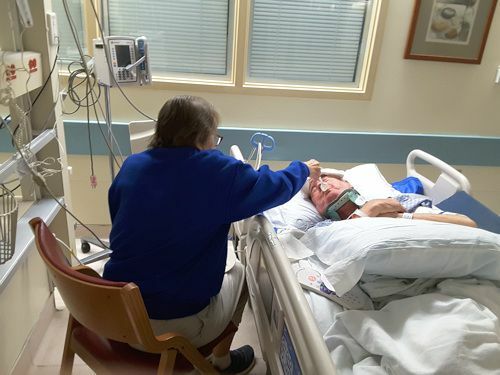 If our loved one has not been close to Jesus or has been rebelling against the ways of God, the coming of Jesus means that he or she finally, at long last, sees Jesus for who he really is as their Savior and Deliverer, Healer, and Friend. All mistaken beliefs about Jesus are washed away. If our loved one is a person of love, they realize that Jesus is the source of that love and they want to spend eternity with him. We can imagine their enthusiastic delight and supreme joy in understanding that Jesus has come for them. Be strong, do not be afraid! Here is your God …. and the ears of the deaf are cleared!